Learn how SAM can mitigate risk and help you gain a more clear visibility into your software inventory. Download this paper to learn more. Meeting the challenges of today’s complex IT environment can be solved without investing in high-capital resources. 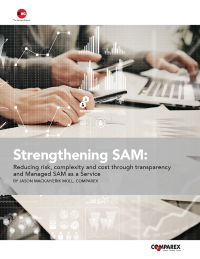 Software Asset Management (SAM) can help organizations manage their fast-evolving software portfolios while reducing costs and complexities.